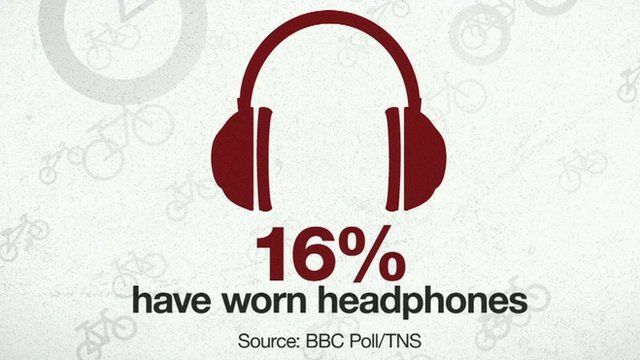 Headphones dilemma for cyclists Jump to media player According to a BBC poll, nine out of ten people think they should not wear headphones, and leading scientists say it can be distracting. Getting lorry drivers on their bikes Jump to media player A poll for the BBC as part of our cycling week has shown that 5% of people, one in 20, have been involved in a road rage incident between a motorist and a cyclist. Boardman's cycling safety tips Jump to media player Olympic medallist Chris Boardman gave BBC News his top tips for making cycling in the city safe and enjoyable. Boris Johnson has suggested banning them, and in New York you cannot wear them in both ears. But should people be allowed to wear headphones while they are cycling? Transport Correspondent Richard Westcott has been finding out what happens when you listen to music on two wheels.